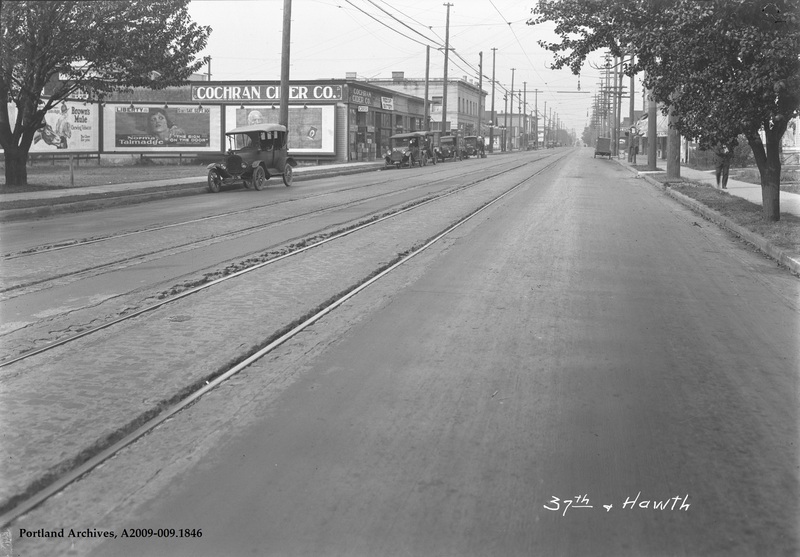 SE Hawthorne Boulevard looking west towards SE 37th Avenue, 1921. City of Portland (OR) Archives, A2009-009.1846. Great photo! This will make for an excellent ‘then and now’ comparison. So the Cochran Cider Co. is where the Bagdad Theater is today. One small observation I had, there is a sign at the curb on the right side of the photo. It is for Associated Gasoline and is right over a small gas pump. Curb service gas sales were common until traditional service stations became common. Likely the business this was in front of was a hardware or auto parts store. This is just a few blocks from me and just one year or so after my home was built in the “Paradise Springs” area. I love my little home, have lived here for 41 years now. Thank you for posting this photo! I’m pretty sure it’s right about here. The building where “Cochran Cider Co.” is in this photo is where the Bagdad Theater is today (the building on the SW corner of 37th looks the same). And on the left, the future site of Nick’s Coney Island tavern in 1935. A landmark of coneys, beer and baseball. The Sign on the Door was remade as a talkie in 1929, starring Rod La Rocque (great name!) and 22 year old Barbara Stanwyck in her 2nd film role.